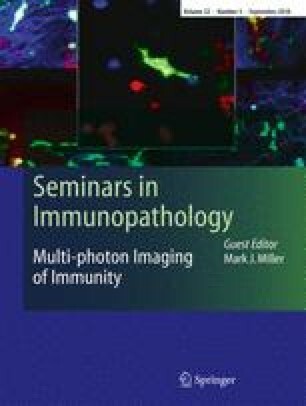 Since the first applications of two-photon microscopy in immunology 10 years ago, the number of studies using this advanced technology has increased dramatically. The two-photon microscope allows long-term visualization of cell motility in the living tissue with minimal phototoxicity. Using this technique, we examined brain autoantigen-specific T cell behavior in experimental autoimmune encephalitomyelitis, the animal model of human multiple sclerosis. Even before disease symptoms appear, the autoreactive T cells arrive at their target organ. There they crawl along the intraluminal surface of central nervous system (CNS) blood vessels before they extravasate. In the perivascular environment, the T cells meet phagocytes that present autoantigens. This contact activates the T cells to penetrate deep into the CNS parenchyma, where the infiltrated T cells again can find antigen, be further activated, and produce cytokines, resulting in massive immune cell recruitment and clinical disease. This work was supported by the Deutsche Forschungsgemeinschaft SFB571-C6, SFB-TR43-B2, the Multiple Sclerosis competence network “Understand MS,” and the Hertie Foundation. We thank Dr. Hartmut Wekerle for his helpful comments. We acknowledge the secretarial assistance of Mrs. Cathy Ludwig.